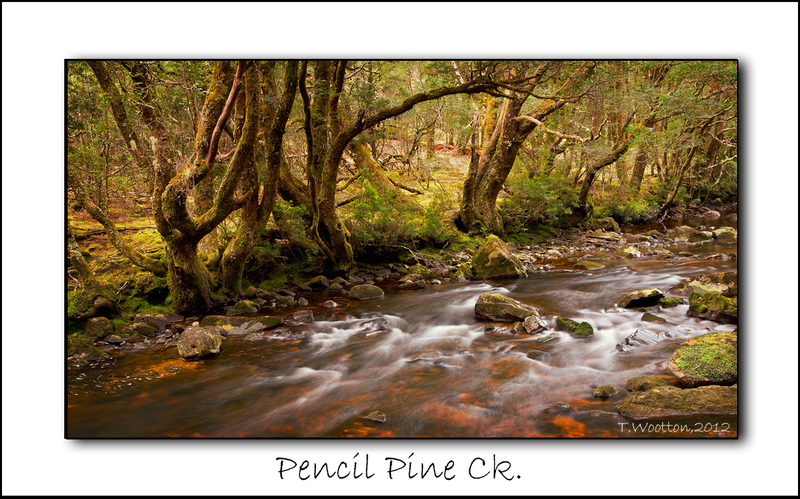 A nice peaceful image from one of my favourite short walks in the Cradle Mt area. The Dove Canyon track starts from near Cradle Mt Lodge and follows Pencil Pine Ck through beautiful Myrle Forest for the first kilometre or so before heading along the top of the Dove Canyon. The full walk is quite a hike in places but takes you through some magnificent highland country but everytime I am in the area I always go for a short walk along this track because it is such a peaceful place and I am hoping to one day catch a glimpse of a faerie because I am sure they inhabit the area, or maybe a troll! This will be my last post for a little while as I am off to visit Europe and hopefully Scotland for a month and hopefully return with some good images! If you have had a look through my blog you may have noticed that I have a fondness for mountains with clouds around them. When I notice stormy clouds settling around high ground I start looking for some sort of interesting foreground and hopefully some sunlight filtering through the advancing (or retreating) clouds, not always as easy as it sounds! 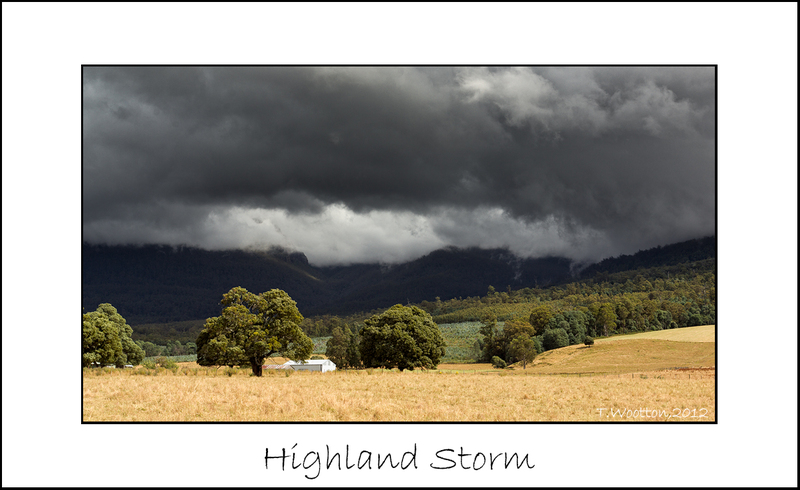 While driving around the Western Creek area in Tasmania I noticed clouds advancing across the Great Western Tiers, so after heading down a couple of side roads with no success I finally found this scene. It was just a matter of waiting for sunlight to hopefully illuminate the foreground to contrast with the threatening cloud over the mountains. I was reading an article by Ken Duncan the other day and he was extolling the virtues of “wildlight” or “chíaroscuro”as it was termed by Renaissance landscape painters. “Wildlight” refers to the conditions where sunlight is broken up by passing cloud and is often associated with the back end of stormy weather. Great to find but it can be difficult light to work with! Waiting for the light to fall just where you want it can be an exercise in patience and frustration interspersed with mild panic as a rain shower descends upon you! If you have the time to wait you can be rewarded with some great images. This image was taken at Lake Mackintosh near Tullah in Western Tasmania, an area of rugged mountains covered in thick temperate rainforest and is subject to wild & highly changeable weather conditions. This really was an exercise in patience as I waited for the sun to illuminate the foreground & the cliff face simultaneously and get stormy cloud in the background! 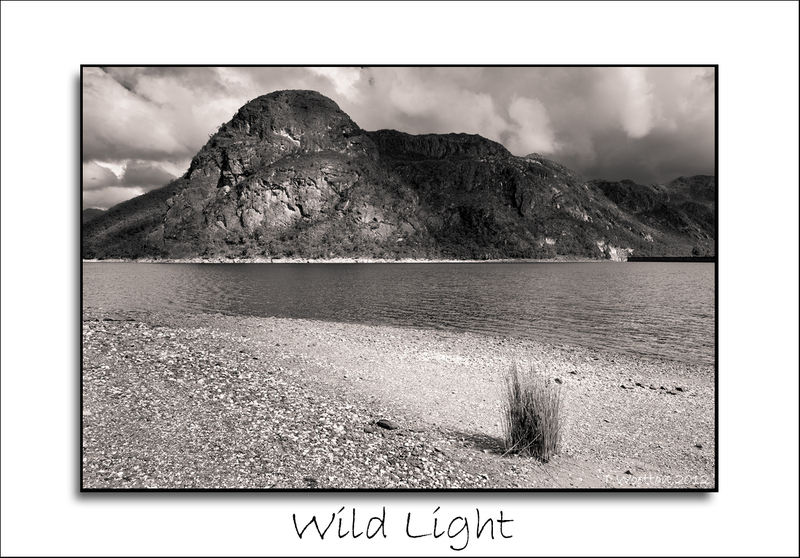 After attempting to tone down the bright foreground in the colour version with little success, monochrome was the answer! First of all, it appears this blog has picked up a small following, which kind of surprises me as I don’t consider my images to be anything really special. There are far better images out there than mine! But to those people who follow my blog and those who stumble across it and leave a ‘Like’ thanks very much! I will endeavour to keep it as interesting as I possibly can. Please feel free to leave a comment about the images I post,good, bad or whatever! 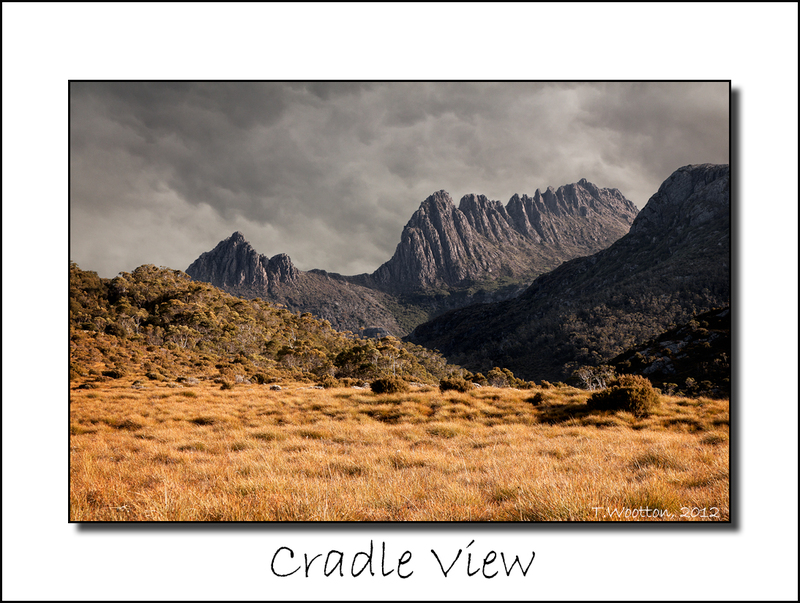 It occurred to me that most images of Cradle Mt. are shot with wide-angle lenses which show a lot of foreground which is hopefully interesting but also push the mountain into the background. Luckily, with that distinctive shape, it will still get the attention it deserves. As I was driving up to Lake Dove one day I noticed that at one spot the mountain seems to loom over the surrounding buttongrass plains with little else to compete with it. On the way back I decided to investigate that view a little more closely and this is the result. It is a slightly different perspective of the mountain helped by the use of a 105mm focal length. 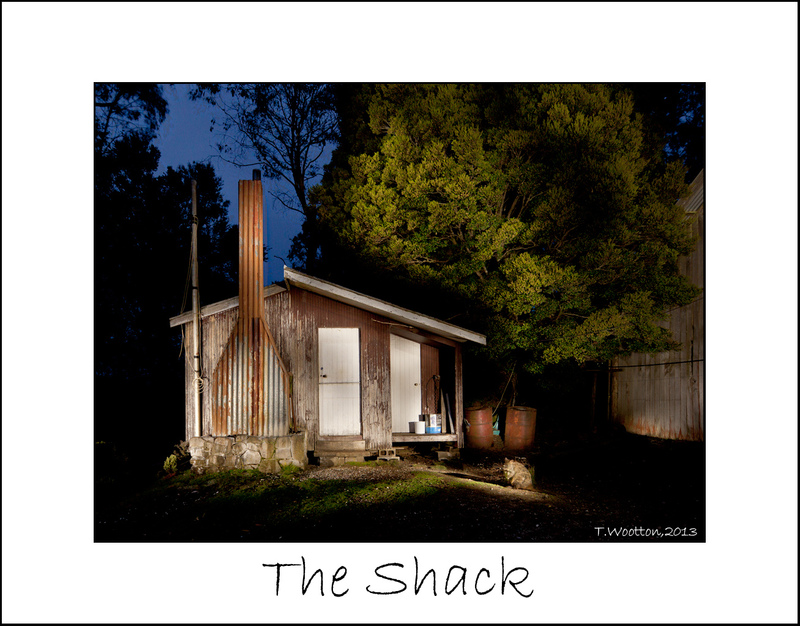 On my last night in Cradle Mt, I thought I would have a little go at lightpainting. This is Alec Ellis’s hut and as a bonus a visiting pademelon stayed long enough to be included in the shot! This is a combination of 4 different images stacked as layers in Photoshop and all blended with with the Lighten blend mode. Exposure for each image was 30s @ f8, iso200. Today is Australia Day! One thing that Australia is known for is our beaches. We just happen to be blessed with miles & miles of some of the best beaches in the world, many of which,see very little human activity apart from fishermen, surfers and the odd beachcomber. 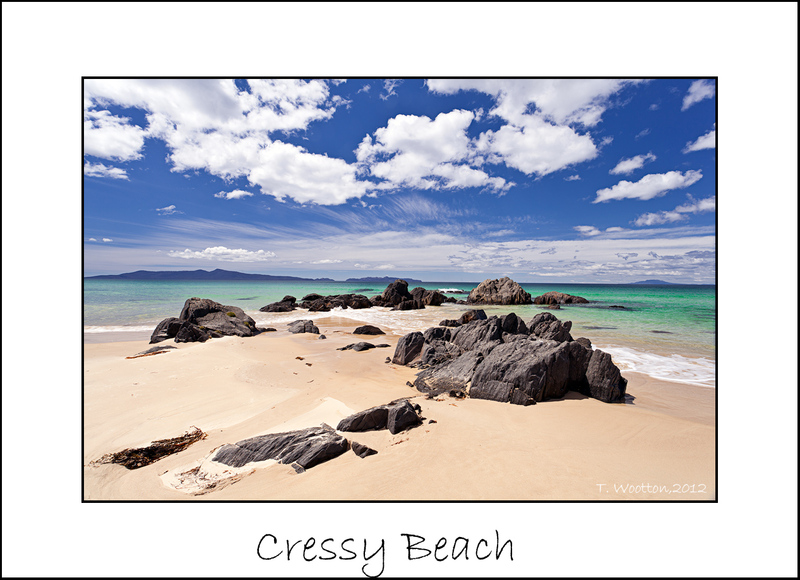 The East coast of Tasmania has some stunningly beautiful beaches that for the most part are deserted. This is one I found near Swansea and I spent a good two hours here without seeing another person, heaven! This rocky outcrop was an obvious subject, combined with the colours of sea & sky, a couple of nice images was the result. I think you’ll agree! 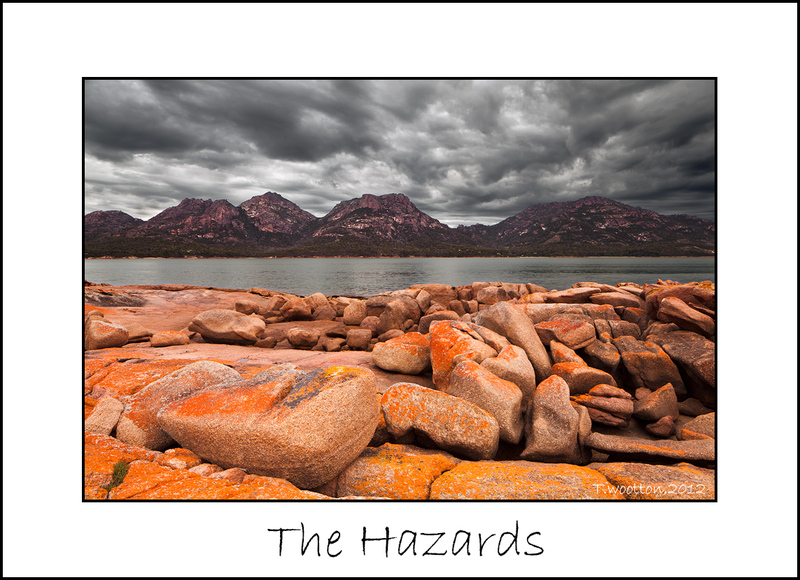 Another image from Coles Bay, this time it is of The Hazards. Even though the light is not the best, I like the contrast between the bright, lichen covered granite in the foreground and the stormy sky. Guess I will just have to go back one day and wait for the good light!